Rosemary Rainey, chairperson announced Mr Gavin Boyd as the Interim Chief Executive of the Belfast Education and Library Board to fill the void left by the resignation of the former Chief Executive on February 29th, 2012. No reason for the resignation was disclosed. The PR states that no addition remuneration will be paid on top of the £145,000+ salary that Mr Boyd currently earns. 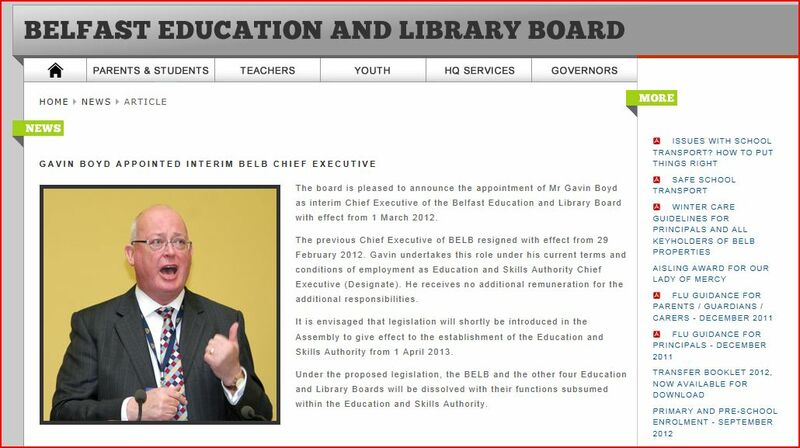 If the Executive believe that Mr Boyd is the best candidate to fill the role at BELB instead of asking someone else to act up then it follows that the chief executives of all the other ELBs should be fired and the monies saved ploughed back into the schools budget. Meanwhile meatings of the ELBs Chief Executives could take place in a mirrored room with Gavin Boyd talking to himself and then emerging to tell the media of his decisions. Oops – with him holding three influential positions in education despite a string of failures the MLAs had better hope he does not enter politics.